Oatlands handmade: Oatlands is getting famous! Well, what an exciting few days - helicopters whizzing around the Mill, mauve soft top VW's buzzing about the streets, lots of interesting people walking about holding up light meters and the Companion Bakery closed for "filming". Who do you suppose was in town? This is me and my new friend Poh! 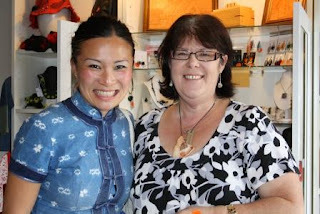 The lovely Poh (Master Chef and the ABC's Poh's Kitchen was in our village over the past couple of days filming at the Callington Mill and the Companion Bakery. Our little shop was favoured by Poh and her lovely Production Coordinator late Friday afternoon and yesterday again during a break in the filming schedule. We were thrilled to wrap up purchases and send the ladies on their way also with a Show Bag from Taz Wild Foods featuring their new infused olive oils and bikkies flavoured with Tasmanian native seeds and herbs! Well look at you!!!! Good to see you are wearing a great necklace!!!!! What a wonderfully creative combination. Agree with Soewnearth....It's great to see the various ways you promote your suppliers. It's great to see the various ways you promote your suppliers. any idea when the show will be on air?